The Anglican-Roman Catholic International Commission - called ARCIC III - has announced that the first meeting of the third phase of dialogue (dubbed ARCIC III) will be held at our monastery of Bose on 17–27 May 2011. We are grateful to the Pontifical Council for Promoting Christian Unity and to the Department of Faith, Unity, and Constitution of the Anglican communion for having chosen our monastery as a propitious place for their fraternal dialogue. On our part, we wish to assure them already of our prayers and our commitment that the Commission’s meeting might take place in the best possible way and may bring fruit according to the Lord’s will. 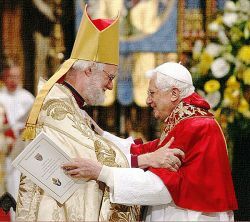 This initiative reflects the wish expressed by pope Benedict XVI and by the archbishop of Canterbury, Rowan Williams, on the occasion of their meeting in Rome in November 2009. The Commission will discuss in depth topics such as “The Church as communion, local and universal” and “How in communion the local and the universal Church comes to discern just ethical teaching”. The official dialogue between the Catholic Church and the Anglican communion, proposed by Paul VI and by archbishop Michael Ramsay of Canterbury in 1966, is carried on by the International Anglican-Catholic Commission (ARCIC), instituted in 1970, and by the International Anglican-Roman Catholic Commission for unity and mission (IARCCUM), created in 2001 to translate the degree of spiritual communion already reached into concrete steps. ARCIC III is composed of eighteen members (ten from the Anglican side and eight from the Catholic) and brings together a wide spectrum of cultural backgrounds and theological disciplines. Its co-presidents are Bernard Longley, archbishop of Birmingham, England (Catholic), and David Moxon, archbishop of the dioceses of New Zealand (Anglican).